We can thus defensibly approach action with a focus on strategy, execution, or interaction between substantially independent actions. The first two views correctly recognize the value of unified action towards a coherent purpose and of skill and autonomy on the ground, respectively, but tend to underestimate their own limitations and lead to disappointment and ineffectiveness. The latter view more accurately captures the challenge of action. As with most top-down hierarchies, the primary source of direct interaction between actions is the connection between the parent and its immediate children. Parental strategy defines children’s goals and thus acts as an interface which propagates goals across hierarchy levels. But while it clearly imparts the ‘what’ of the goal, the ‘why’ remains partially inaccessible to the child action. Each goal is thus simultaneously part of the parent and of the child; each child action is simultaneously part of strategy and part of execution. Strategies continue to generate lower level actions until execution reaches a fundamental unit of thought or action. Goals of these actions are intertwined so tightly with implementation that they collapse into a single whole – into pure execution – where strategy is short-circuited and the goal’s ‘why’ scarcely matters. These actions, more appropriately referred to as capabilities, are called upon by higher level strategy rather than being in some way defined by it. Capabilities aren’t fundamental in any absolute sense. On one side, we routinely turn massive action hierarchies into capabilities through conscious training and unconscious repetition. Consider sports, grammar, speech, and driving to name a few. The value of experience can be partially ascribed to possession of complex capabilities. On the other side, our most basic capabilities – like a movement of a limb or a thought about it – are themselves vast hierarchies of action, just ones that are below the level of abstraction that is relevant, or accessible, to us. They seem to happen, as if by magic, but are driven by complex hierarchies of goals and strategies held, arguably, by independent actors. These hierarchies themselves dead-end into capabilities that appear fundamental, but merely abstract even lower level complexity. The search for bottom motivates the study of subjects like consciousness, physics, and theology. In this post I mean fundamental units of thought and action in a hopefully common sense way: a point where execution appears automatic. The following diagram hints at what the execution component of a very simple action looks like; consequential actions will have many more levels. 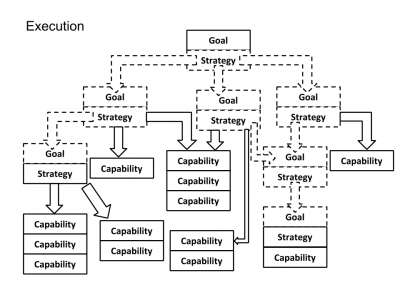 The dashed lines represent components that could be treated as either strategy or execution if the hierarchy was forced into a single set of goal, strategy, and execution buckets. This diagram is meant as a simple visualization rather than a comprehensive model so don’t read too much into it. The point is that action is complicated, that the line between execution and strategy is blurry on most levels, and that actual execution – in a sense of interaction with reality – is far more diffuse and low level than it appears. What about following the hierarchy of action in the other direction: where do our goals come from? As we just saw, a major source of goals is higher level strategies, but that only begs the question: what goal is at the top of the hierarchy and where did it come from? Part of the answer is rooted in biology. We have predispositions and goals as a consequence of being human. Furthermore, each of us has more specific preferences encouraged by our individual genetics. These predispositions, like execution capabilities, are foundational – their ‘why’ is hidden in evolutionary history. Part of the answer is in the environment we are born into. Our society, community, and family encourage some goals and discourage others. This occurs intentionally through schools, stories, and advertising, explicitly through traditions and laws, and implicitly through everyday interactions. Accidents of our experience generate their own goals. Interaction with a specific book, person, or toy motivates unique short term goals that push us along one path instead of others. These goals can develop into values and preferences that feel as natural as the desire to be free from pain or to be respected; it is possible, in other words, for something like football or stamp collecting to end up on a comparable level of unquestioned value. We can argue to what extent high level goals are innate or developed, but whatever the answer, many of them are seeded early in our development and incentivised as we grow. High level goals such as being free from pain, being a good person, being recognized, and being competent form the backdrop of our lives. Values, traditions, and interests emerge from strategies to achieve these high level goals. They are complimented by path-dependent goals that come from our experiences and by rule-of-thumb strategies that are presented to us as goals: be polite, be debt-free, go to school. As we can see, goal formation isn’t a clean, well designed process. Goal foundations are amorphous, often arbitrary. Goals can come about independently and create unrelated hierarchies. Some develop from decisions we barely perceive, some from advice of others, some from manipulation. There is little reason to presume that our goals are objectively true or consistent among themselves, but we start out believing exactly that. As we accumulate experience we increasingly run into conflicts between action hierarchies. Complex execution forces us into trade-offs. Desire to explain our values forces us to make them explicit and reconcile them. We try to unite our goals, usually through a deductive process that generates even higher level goals and strategies. We reject, modify, and re-prioritize hierarchies that we can’t unite. We turn some high level goals into visions and make it our goal to impart them on the wider world. Attempts to integrate, explain, and implement action hierarchies can generate our highest level goals. But while conflict can encourage productive synthesis, it can also lead to calcification and replacement of hierarchies, which – however imperfect – embody a lifetime of complexity, with rashly constructed strawmen. Inconsistencies can drive us to escape cognitive dissonance without resolving their source. New goals spawned by isolated experiences of pain, injustice, and disappointment can grow into massive hierarchies that push out other goals. So our goals come from biology and genetics, accidental experiences, interaction with society, attempts at unification of existing goals, responses to negative experiences, and higher level strategies. Strategy is in essence an optimizer. It converts goals, capabilities, and constraints into a plan that drives execution towards goal achievement. Strategies strongly benefit from understanding of the entire action hierarchy. An ideal strategist can go all the way up the action hierarchy to the highest vision and all the way down to the smallest action in pursuit of a perfect plan – a top-down ideal that the waterfall methodology attempts to formalize. While many deviations from the top-down ideal are either mistakes or concessions to pragmatic limits, optimal strategies don’t have to be top-down or tightly connected to other parts of the action hierarchy. Exploration can generate strategies and goals out of low level action. It can be an explicit strategy when we can’t think of anything more effective, a response to restlessness, or be driven by high level goals like curiosity or sense of adventure. Some strategies, exemplified by the agile methodology, harness this ability of execution to illuminate goals and fill-in plans. They have defined high levels goals, such as to make money or to make what people want, and low level strategies that enable fast iteration and feedback evaluation, but depend on execution to fill in the middle of the hierarchy. Opportunistic strategies have a clear sense of goal importance, but don’t have immediate, or necessarily detailed, low level execution plans. Their essence is to wait, recognize high-return opportunities, and interrupt current action to focus on them. They are common in investment, creative work, and dating, but we all have some action hierarchies in an opportunistic holding pattern – most of us would stop to pick up a $10 bill on the street. Opportunistically modulating execution between hierarchies is one of the few sources of free lunch in action; finding goals shared by hierarchies is another. Rich move strategies pursue goals that are likely to be applicable to many different hierarchies without necessarily being connected to a specific high level goal. For example, development of skills and knowledge, accumulation of resources and connections, pursuit of freedom and health. Goals like these can generate massive hierarchies of action without a concrete answer as to why they are being sought. They, together with exploration, bootstrap much of our meaningful action, but can turn into pathologies if they never connect to a larger goal. As different as these strategies are, they all depend on something outside of the three components of action: our models of reality. 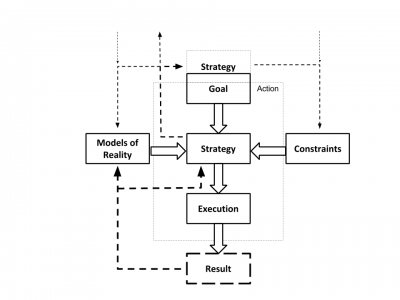 It is models that enable us to predict the consequences of execution, to simulate a variety of plans, and to pick out the optimal one to reach our goals. Models tell us how the world works and allow us to predict what will happen in response to our actions. But they also tell us what is happening. It is a common mistake to believe that we experience objective reality, when we only experience representations of reality produced by our brain’s attempt to fit sensor information into its own models. Models drive our perception of where we are as much as our expectation of where actions will take us. Models are how we understand the world, they are the backbone of our goals, strategies, and execution. So where do they come from? Our earliest models come about inductively from experience. Since early experiences are motivated by foundational goals defined by our genetics and first experiences, the specific models we develop depend on the same foundations. How the world responds to our attempts to reach basic goals defines our initial understanding of how the world works. We verify these models and fine-tune them as inconsistencies are found. Our confidence increases when models seem to predict reality. With enough confirmation, models are taken to be reality and form the building blocks of future models. With enough time and layers, these assumptions become effectively irreversible. All of this occurs whether or not we guide the process consciously. Take causation as an example. It appears foundational, but there was a time when it developed from experience. It takes infants time to associate their thoughts with the movement of their limbs, or their cries with the resolution of their problem. Causation isn’t a foundational axiom, but becomes indistinguishable from one beyond a certain level of development. Not only do our models get progressively more sophisticated with time, our methods to generate and verify models also improve: we develop models of model generation. We learn to create models not only by induction, but also by deduction. We are able to hypothesize models from existing ones and even theorize them from scratch. We can create experiments to test predictions of these models and thus understand reality that we might have never experienced naturally. Our models of reality, like actions, are thus hierarchical with foundational models transformed into truth by long forgotten history. And as with actions, we have many hierarchies of models that aren’t connected or consistent among themselves. But while action hierarchies tend to be top-down constructs that deduce low level actions from high level goals, models of reality usually grow to higher levels of abstraction from the bottom up. Other people shape our models even more than our goals because their actions directly influence inductive model formation. At their broadest, education and socialization are attempts to shape individual models of reality. Since models tell us what the world is, what is possible, and what to expect, they are an essential input into strategies and, through them, into lower level goals. In a sense, strategies are instantiations of models – including models of model generation – in service of higher level goals. Our strategies create a hierarchy of actions based on model predictions, but since models are not reality, results of execution do not perfectly follow even the most careful plans based on most well-thought-out models. Each deviation moves reality further apart from strategic predictions. If models influence our strategies, which lead to actions, which result in experiences, which affect our models, then we should expect our models and strategies to become outdated and require adjustment. Without effective feedback management our actions will disintegrate into pursuits independent of goals. Strategies need to update affected action hierarchies and pass along discrepancies to higher level strategies. Models need to assimilate new information so that our understanding and ability to make future predictions improves. But feedback doesn’t just validate our models and keeps us on track, it helps to define the action hierarchy. We already saw how goals and models can generate from experience and how some strategies tap into this process. But even after goals, strategies, models, and capabilities take their place in a top-down hierarchy, they are rarely in a solid state that the hierarchical view of action implies: they are given shape, fine-tuned, and uprooted by results of the very actions that they initiate. Our high level goals are often loose, intuitive visions that are better at recognizing whether a result is desirable than at guiding action. Our models are similarly amorphous: we struggle to make them explicit without sacrificing accuracy. Our capabilities are uncertain until we test them with real stakes. Our strategies are limited by the cloudiness of our goals, models, and capabilities and our inability to see past unknown decisions. And our strategies often explicitly require development of new models and capabilities as an intermediate goal. In most domains it is sub-optimal, if not impossible, to decouple plan and model formation from execution. We develop capabilities, validate models, clarify goals, and adjust plans as we act. We also understand more clearly the plausibility and cost of our goals and strategies which legitimates their reevaluation at even the highest levels of the hierarchy. Feedback is thus a full-fledged member of action: essential not only for successful execution, but for generation and reevaluation of goals and strategies. While feedback is chaotic and non-hierarchical, effective feedback management supports the hierarchy and enhances coherence between its components. It is a major challenge to propagate feedback, interpret it, and make adjustments. Our actions directly interface only with the strategy of the parent action – through the passing of goals – while results may affect strategies many levels higher in the hierarchy and coherent adjustments may depend on a greater understanding of ‘why’ than has been made available. Actions are thus constrained not only by resources, capabilities, time, and other physical limitations, but also by the details of strategies much higher in the hierarchy. If actions don’t properly account for constraints, pass along results to higher levels, update models, or adjust lower level goals, then they will fail to achieve the goals that motivate their existence although they may generate a lot of motion and even accomplish their direct mission. This is easy to see in larger organizations where everyone is working, but progress is non-existent or negative. The major challenge of action is how to get many independent actors to coherently pursue a shared goal when communication channels are limited, incentives aren’t well aligned, subtlety of strategy and crispness of reality are muffled by multiple levels of interpretation and generalization – in other words, how to solve the principle-agent problem across a massive hierarchy. The challenge is structurally the same for individuals. Just like independent actors, we aren’t always clear about how our actions connect with higher level goals and strategies. Even when we understand the constraints, we frequently get lost in the challenge of low level execution and allow its accomplishment to overshadow our larger purpose. Consider how much our decisions are affected by our emotions and how much those are affected by recent actions. Consider how deeply loss aversion, and other biases convincingly covered in Thinking Fast and Slow, are embedded in our psychology and how they prioritize lower level goals. It takes more than information to act coherently in service of goals: it takes a special set of capabilities. Action hierarchies depend on skills that aren’t visible in the hierarchy. There is no obvious place for abilities to formulate a strategy, maintain coherence demanded by constraints, propagate feedback, reconcile conflicts, recognize shared goals between separate actions, find motivation to act – or to keep acting competently – through adversity and frustration, or focus on improvement of abilities rather than on excuses. These abilities, and many more, tend to be taken for granted even as they are complex, rarely well developed, and essential for effective action. They are a type of constraint and are as difficult to see as higher level strategies, but even more important. Awareness of them encourages plans that work within our limitations. Development of them is among the richest of moves. The quality of meta-capabilities is the difficult to pinpoint difference between people who vary significantly in effectiveness, but appear equally capable. Meta-capabilities tend to overwhelm other considerations in real-world action, but rarely receive due attention. Neither does the impact of the world on our mental state, which influences the effectiveness of complex processes like meta-capabilities. Tempo appropriately puts our mental state on the front lines of action with its focus on concepts like momentum, narrative, and exhaustion. Meta-capabilities maintain coherence between hierarchies and their layers and enable effective action and feedback in individuals. As scope exceeds the bandwidth of a single person, organizations attempt to embed this functionality first into group consciousness and then into formal procedures. These procedures enable scale, but cannot evolve quickly enough; they cease to respond to feedback appropriately and ossify. Individuals who allow their meta-capabilities to solidify into static procedures similarly turn into cacti or weasels. The core of action still has a sequential relationship between goal, strategy, and execution that we started with, but this core is a far smaller part of the whole than it initially appeared. Execution is itself a sequence of actions, the goals of which are intertwined with strategy of the parent action. 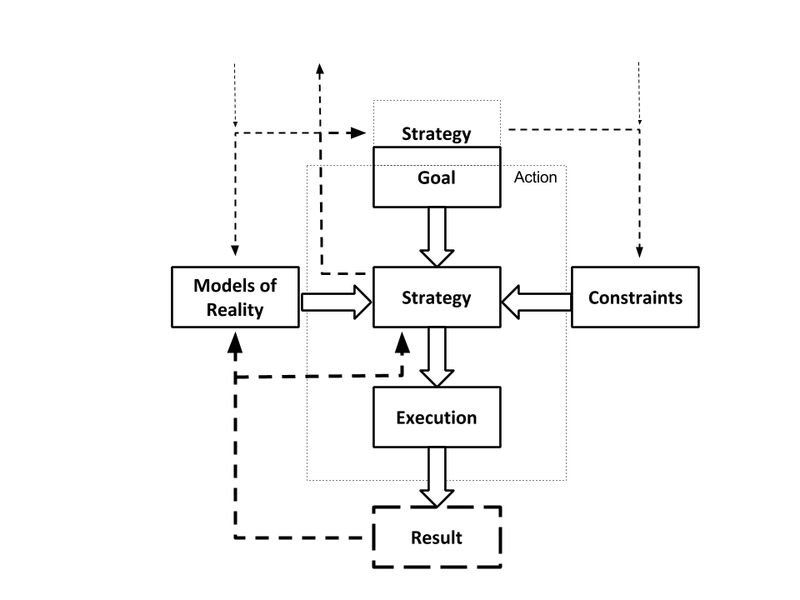 Strategy depends not only on the goal of action, but on models of reality and constraints. Since actions are largely hierarchical, higher level strategies don’t interface directly with lower level goals. Instead, the demands of these strategies are a form of a constraint that may not be immediately obvious. Models of reality represent our perception of world state and our understanding of how the world works. Results of actions adjust the state of the world and validate our models of reality. Models thus need to change and strategy needs to incorporate these modifications and propagate them to both lower level actions and higher level strategies. Quality of feedback management, and with it coherence of the hierarchy and effectiveness of action, depends on meta-capabilities, which are crucial, but difficult to see, constraints. The diagram shows feedback by dashed lines. Feedback to higher level strategies comes back as changes to be incorporated throughout the hierarchy. As the decreasing weight of feedback lines insinuates, the process is lossy. I don’t claim that this model is comprehensive or indisputable. This is a deep topic with a substantial and divergent body of literature in the fields of management, cognitive science, artificial intelligence, and others. I do believe that, even as a rough starting point, it has plenty of insight to offer into practical challenges, mistakes, and limitations. 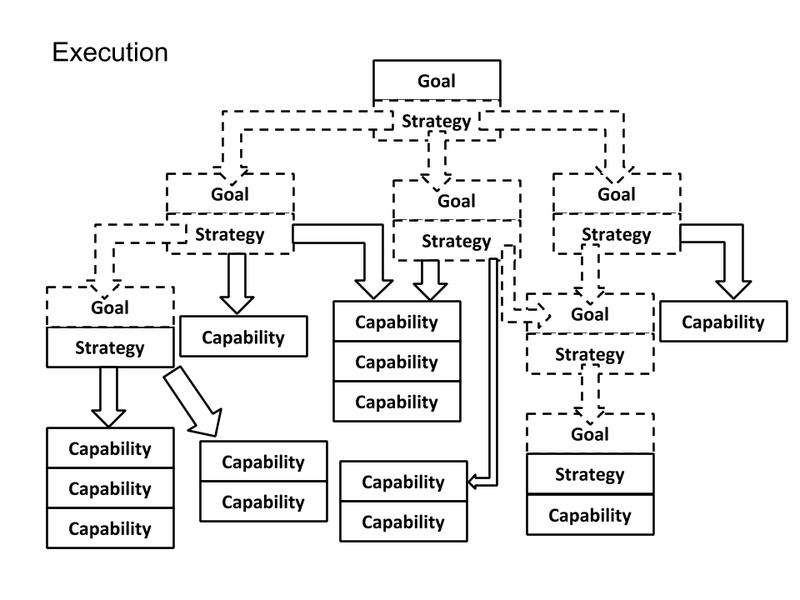 The challenge of action, as highlighted by this model, is that we don’t just need to have clear goals, valid models, coherent strategies, and effective capabilities – although we do and it is rare; we don’t just need to combine them all cohesively with constraints and respond to feedback – although we do and it is hard; the core of the challenge is that we need to propagate strategies and feedback, to execute, and to adjust through a vast hierarchy of loosely connected and substantially independent actors.